We were blessed to have a 2 week Spring Break mid-March. In part, it's done for travel opportunities. Here at my house, we didn't go on any major exotic trip, but we did do some local day trips, a long weekend to Philadelphia, and then we enjoyed a week-long visit from my mom. It was my kind of nirvana. 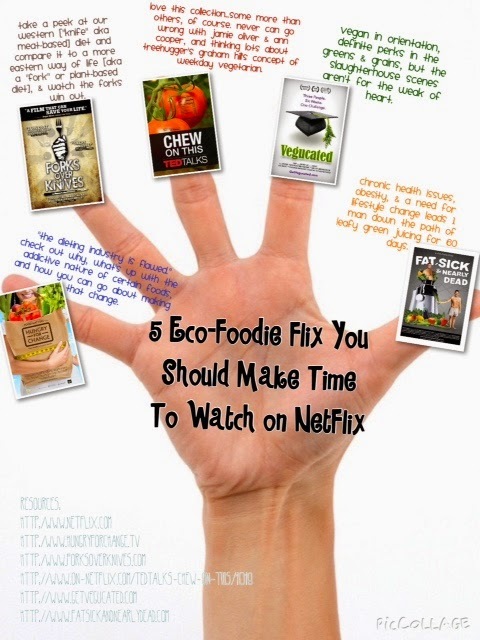 Also during that time, I managed to start a few health trends for myself, and I also watched a handful of eco-foodie films and documentaries. Eye opening food facts galore! After watching, in addition to upping my fruit & veggie intake, diminishing my daily Diet Coke consumption, and upping my water du jour, I've dropped more than a pound or two. In addition to all of that, I creating the the following infographic about my five newest favorite films. I also linked it to trailers using the ThingLink website. Click the icons below the movie posters to find the trailers to these flix.